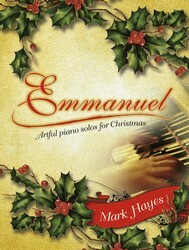 Level 3 The artistry of pianist/composer Mark Hayes is magnificently on display in this extraordinary collection of Christmas carols and its companion listening CD (available separately). Eighteen carols, old and new, are creatively explored in these fifteen handsome settings, with some titles emanating from the chants of the early church and some from the newer classics of today. All are afforded the unmistakable creative touch of Mark Hayes, and all are suitable for the concert stage or seasonal worship services. Whether you are playing or listening, these carol settings will enhance the joyful and tender moments of the Christmas season.